AIPU Solids Control finished a tank valve order and delivery to Indonesia end of this week for a tank manufacturer. There are many mud tank manufacturers that build tank need solids control accessory or related spare parts. The tank valve is design and install on the mud tank for tank compartment control and mud transfer pipeline requirement. 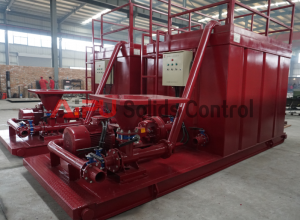 This client ordered some other equipments for a whole solids control system like centrifugal pump, mud agitator, mud gun, tank valves and shaker screen in Apr. The client repeat an tank valve order for another client after good feeback of last order. There different type of butterfly valve with different regulation and standard. The China company supplied valve all China standard of water type butterfly valve if no special requirement. Many client may need US or UK standard valve to keep sure all connections good with original pipeline, so please make a note and request on the order, there are various regulation of valve can be supplied in China. 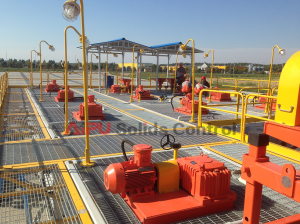 For many countries, they will use lug type valve instead of water type valve, especially for outside connections. Please make a note or special requirement with your suppliers, in case there are mis-understandings on butterfly valve options. AIPU stand tank valve choose will be depending on client special request or tank design and valve applications. If no special request, AIPU will choose water type China standard butterfly valve. Depending on standard choose or client requirement, AIPU will choose lug type valve or US / UK standard valve. Here we’d like to mention that lug type valve is the best option for outside connections of pipeline. AIPU will try to make everything to meet client application requirement. So please don’t cut price only but focus on material and design choose. There are many suppliers that offer product much cheaper and looks like a same thing but in fact lower configuration at all. Please believe the product always value the price!